Not Quite Right! 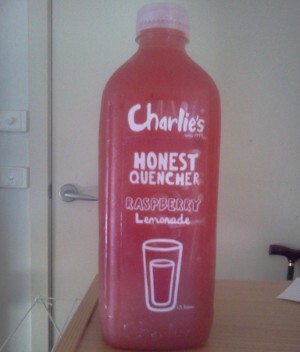 : Raspberry lemonade, yum! Last week when I did my shopping, as usual checked out the specials, not only to save money but it's also a great chance to try different products you wouldn't normally buy. I'm not much of a fizzy drink consumer only occasionally partaking, I usually get a bottle of coke or a flavoured mineral water, in the specials this week something caught my eye, "Charlie's Honest Quencher Drink Raspberry Lemonade Chilled" it cost about $4.00 for a 1.5 litre bottle (on special), a square plastic bottle at that. You can also get a traditional Lemonade as well and quite a few other interesting products, mainly drinks I think and some smoothies. I might have to try some of their other beverages, they are all a little different, but sound nice regardless. I was a little surprised when I took my first drink, it wasn't fizzy, perfect, it's not a fizzy type lemonade, it's a very nice drop, I have bought it again in this weeks shop. I have added a photo of the bottle it comes in when it's full as I had consumed both the original bottles, they make great bottles to use for cold water as well.